Check out this week’s movie news! This summer and fall is going to be full of animated awesomeness (with a little live-action fun thrown in for good measure). There are also some more free printables for you to enjoy. There’s finally a teaser trailer and first look images available from Disney’s upcoming Frozen! I’m excited for this movie as it’s done by the studio that produced both Tangled and Wreck-It Ralph, two of my favorite more recent Disney films. Fearless optimist Anna sets off on an epic journey—teaming up with rugged mountain man Kristoff and his loyal reindeer Sven—to find her sister Elsa, whose icy powers have trapped the kingdom of Arendelle in eternal winter. 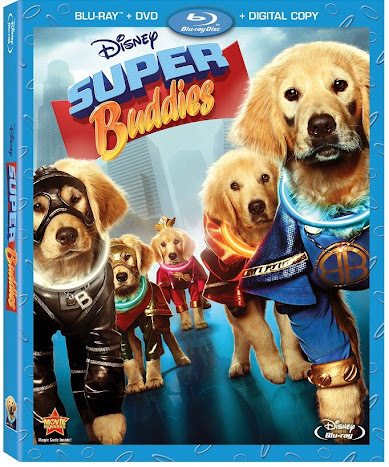 Disney’s Super Buddies is a highly-anticipated movie in our house. Bubbles loves dogs and has so far loved all the “Buddies” movies we have watched. This installment takes Budderball, Mudbud, B-Dawg, Buddha, and Rosebud on their biggest adventure yet as they discover mysterious rings that grant them each a unique super power. They have to race to the rescue when a shape-shifting bully from outer space threatens the planet. Can they do it without revealing their secret identities? Arthur Stands Up To Bullying – Bullying is an important topic. Through the four episodes included on this DVD, Arthur and his friends & family learn to stand up to bullying, talk about teasing, and think about friendship. 60 minute run time. Dinosaur Train: Nature Trackers – In this DVD kids will learn about stargazing, snakes, and nature’s life cycle as they tag along with Buddy as he plants a garden, visits ancestors, and builds a clubhouse. 100 minute run time. Super Why! : Hansel & Gretel: A Healthy Adventure – In the two included episodes (including King Eddie Who Loved Spaghetti), kids will learn about different types of foods and the benefits of healthy food choices. 50 minute run time. Caillou: Big Kid Caillou – Growing up is the greatest adventure of all. In these six episodes Caillou navigates becoming a big kid by teaching about kindness, friendship, being themselves, and flexibility. 50 minute run time. Have you seen Oz yet? If not this weekend would be a great time to pick up a copy or stream it on Amazon. 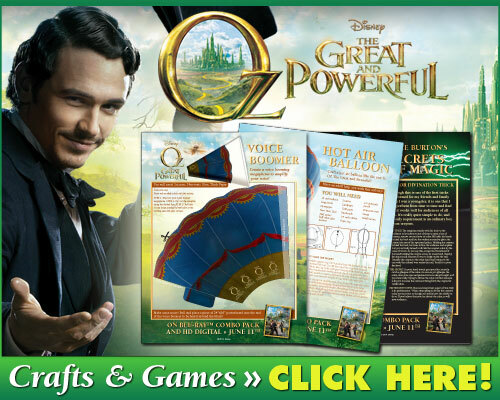 You can also have some Oz fun with these free printable crafts and games. Just click the image below in order to download and print. One of my all-time favorite Disney movies is coming out of the vault! 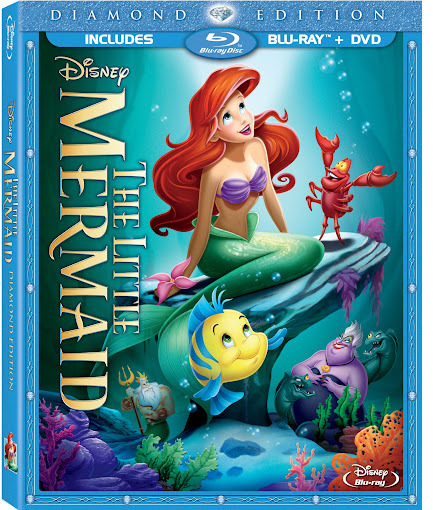 For the very first time Ariel and friends are splashing onto Blu-ray Hi-Def in the newly restored The Little Mermaid: Diamond Edition. It will be available for purchase on October 1st and I guarantee this will be joining our collection of Disney movies. I can’t wait to introduce Bubbles to songs like “Kiss the Girl” and “Under the Sea”. And speaking of songs – Carly Rae Jepsen (of “Call Me Maybe” fame) has been tapped to sing a new version of “Part of Your World”. It will be included as a music video on the Diamond Edition Blu-Ray Combo Pack. 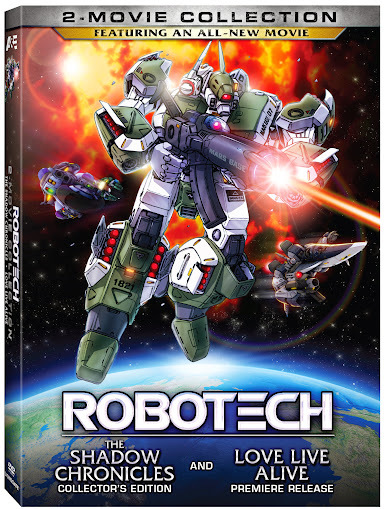 Fans of the original Robotech series will be excited to know that the Robotech: 2-Movie Collection will be available on July 23rd. It includes an all-new movie Love Live Alive as well as the hit The Shadow Chronicles. The new Love Live Alive follows the adventures of Lieutenant Lance “Lancer” Belmont as he recounts his journey from before his first encounter with Scott Bernard to the aftermath following Admiral Rick Hunter’s expedition to liberate Earth from the mysterious Invid race. There are two new behind the scenes videos from The Lone Ranger now available: The Craft and Hi-Ho Silver. (Spoiler alert: be sure to watch The Craft and see just how tough Johnny Depp is when he fell off his horse!) These featurettes do an awesome job of showing off how great the special effects in this movie are, something I’m not sure everyone realizes. It races into theaters in two weeks! Which piece of movie news is most exciting to you?